Hello, hello again, dear readers. Yesterday evening after dinner, Derek called me on my cellular phone from his post in my front yard to notify me that we had company. I have him permission to let the guest pass (figuring it was a Girl Scout or somesuch selling cookies); it was a decision I would come to regret. I soon came to find out that it was the common-law Mrs. Codger’s estranged son, Brandon. I’m not going to take all the credit for rescuing the missus from her controlling son’s control, but let’s just say that when she moved in with me, their relationship definitely fell apart. Brandon: You are unqualified to have power of attorney over my mother (the common-law Mrs. Codger). The Codger: How dare you speak to me like that. You need to learn to have a lot more respect. That’s no way to speak to someone that’s lived through more than one war! Brandon: I’m just saying that you’re in no mental position to have power of attorney. You’ve even let a bunch of teenaged vagabonds take over your own house. 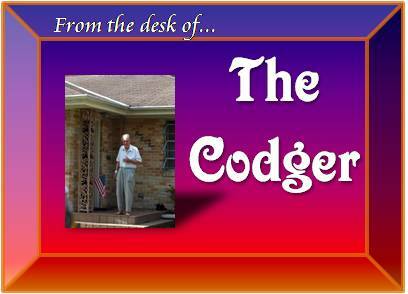 The Codger: Get off my property. You’re trespassing. Derek, please show Brandon off my property. Brandon: You haven’t heard the last of this. Hail fellow. It sounds like Brandon and Brian are two peas in a pod. Some luck! I think you should have all of common-law Mrs. Codger’s assets transferred to your name immediately, in addition to a notarized health proxy, so to avoid meddling by the hand of that Brandon. This generation is wayward, and if you’ll pardon me, it gets my goose sometimes. For example, the other day I found a flyer in my mailbox for an Assisted Living outfit. Am I supposed to believe that it was those who are in need of assistance with their lives, and not my able-bodied daughter, who left the promotion in my box at the top of the steps? !